Johnson's New Map of the State of Texas. 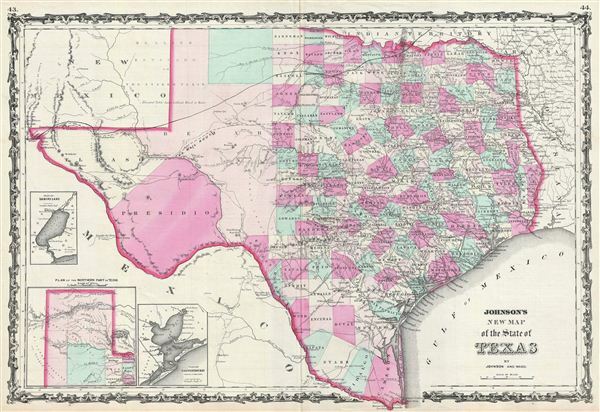 This is an exceptional example of A. J. Johnson's highly desirable 1863 map of Texas. Created during the American Civil War, this extraordinary folio map details the state of Texas in full. Identifies the elevated Table Lands, El Llando Estadado (the Staked Plain), the U.S. Mail Route, numerous geographical notations and color coding according to county. El Paso, Presidio and Behar counties are gigantic and occupy much of the western portion of the state. Insets in the lower left quadrant detail Sabine Lake (with depth soundings), Galveston Bay (from the U.S.C.S. ), and the northern panhandle. Throughout, Johnson identifies various cities, towns, rivers and assortment of additional topographical details. Based on a smaller 1855 map by J. H. Colton. Johnson issued this map in a total of eight states with only minor variations - the present example being the fifth state. Features the strapwork border common to Johnson's atlas maps from 1860 to 1863. Published by A. J. Johnson and Ward as plate nos. 43-44 in the scarce 1863 edition of Johnson's Family Atlas. This is the second edition of Johnson's atlas to bear the 'Johnson and Ward' imprint. Very good. Minor wear and toning along original centerfold. Some spotting at places. Text on verso. Rumsey 0352.033 (1864 edition). Philips (Atlases) 843. Lourie, Ira, Johnson Map Project, Texas 5.0.